This SharePoint App is actually an ASP.Net application hosted on the different server (outside SharePoint environment) which is accessible through Site Contents of the Site collection. Here we are proceeding with a very simple ASP.Net MVC Application. Click on next and select ‘Use Windows Azure Access control service’ and then click on Finish. There will be two part in the solution. The first/upper part will be for SharePoint App and the second one will be ASP.Net web app. A login page will appear. Enter the same credential which you are using for SharePoint on Office 365. 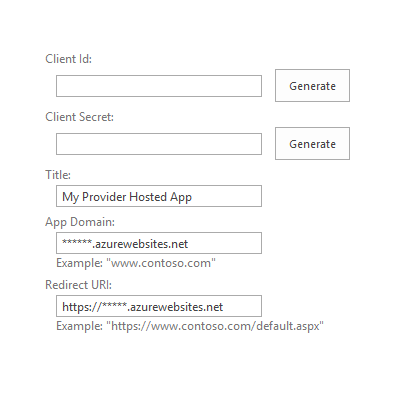 Select the Web App which you have created on Azure, and Publish. Right click on SharePoint App Project of the solution of Provider hosted app. Open Site contents and go to Apps in Testing list. Upload the app package (*.app file) and Deploy. ** We are using this for testing out app before releasing it to all users. Please Note: 'Apps in Testing' list is available only in Developer Site Template. Alternatively or for release purpose you can upload it in 'Apps For SharePoint' list in App Catalog Site collection. App Catalog site collection can be configured from Central Admin >> Apps. Once you upload app in 'App For SharePoint'. For App installation , Go to Site Content >> Add an App >> Select the App and add it. Your Provider Hosted App is ready to use.